Marjorie Theodore on Monday gives her account of the police response to protests at the St. Louis Galleria, where her son was among 22 arrested on Saturday. 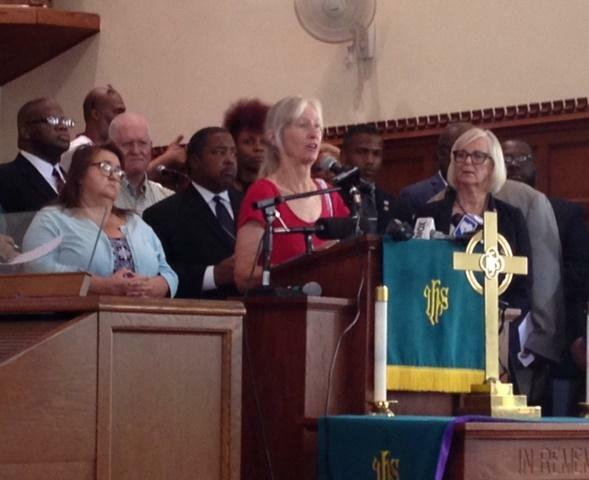 The petite, white woman with white hair stood at a podium in the St. Peter AME Church Monday and quietly told her story, as at least two dozen clergy members and elected officials stood behind her. Nearly everyone who spoke repeated the phrase “police riot” during the one-hour news conference in the church in the O'Fallon neighborhood of north St. Louis church. Officers from the St. Louis County Police and the Richmond Heights Police Department arrested 22 people at the Galleria mall on Saturday. Fifteen people were released on Sunday. Six others were charged with rioting or interfering with an arrest; one woman was charged with 3rd degree assault. “Citizens have been allowed to exercise their First Amendment Rights; however, when those protests descend into criminal activity, law enforcement has no other choice but to intervene,” Belmar said. The police chief went on to say any use of force has been documented and will be reviewed as part of the department’s policy. Missouri state Rep. Stacey Newman, D-Richmond Heights, was among several elected officials at the St. Louis church who called for investigations into the police officer’s action by the U.S. Department of Justice and the state. Newman said she worked Saturday night to try to get information to families of those who were arrested and to get medications into the St. Louis County Justice Center. Attorneys, including those with ArchCity Defenders, said they were unable to get into the Justice Center to see their clients after arrests on Saturday. Saint Louis University law professor Brendan Roediger said the Justice Center was closed, as it had been at times during the protests following Michael Brown’s death in 2014. “They’re definitely sending a message, but not to protesters in general, but protesters specifically around racial justice,” Roediger said. Roediger said, typically, there’s a short period of time during processing when attorneys aren’t able to see their clients. After that, he said, lawyers are able to have access their client at any time, which is especially important in the first 24-48 hours after someone is arrested. Missouri state law actually makes it a misdemeanor for a police officer or a jail employee to interfere with a lawyer’s right to see their client. Among those arrested included a 13-year-old boy who is a member of the AME church. One of the church’s pastors, the Rev. Cassandra Gould said it struck close to home. She said despite working with several clergy members, a judge and a county councilwoman, they were unable to find out much. Gould said there is a breach in the city and the state that needs to be repaired with the help of elected officials. “We recognize most of the current elected officials, with the exception of those who are here and a few others, we cannot count on them to repair it, but you can count on us to vote you out of office, so that we can find those who will repair it,” she said to applause. Elected officials in attendance at the church event Monday called for several actions. Missouri state Rep. Joe Adams, D-University City, said community policing would allow officers to know citizens and prevent fearful interactions. St. Louis Alderwoman Megan Green, D-15th Ward, called for voters to oppose a half-cent sales tax increase on the November ballot that would send more money to the St. Louis Metropolitan Police Department. “We have to say not one more dime goes into this system until we get some accountability, we get some change and we get a police department that protects and serves us and is not out there telling us that they own these streets,” she said. State Rep. Bruce Franks, D-St. Louis, who has been involved with many of protests since the acquittal of former St. Louis Police officer Jason Stockley, promised the protests would continue until race relations improve.